Which starting pitchers should move into the bullpen for the Dodgers? Kenley Jansen’s absence puts more pressure on the rest of the Dodger pitching staff to step up. All summer long, the big question for the Dodger pitching staff has been which relievers would serve as the bridge to Kenley Jansen. But with the distressing news that Jansen will be sidelined at least into September with an irregular heartbeat, we now have to ponder not only the bridge, but the destination. You can read all the options the Dodgers have available in my recent review of the Dodger pitching staff, and Dustin Nosler of Dodgers Digest has a post up today looking specifically at who might close in Jansen’s absence. My focus today is on the fact that it’s obvious that the Dodgers, who will soon have seven starting pitchers available with the impending returns of Alex Wood and Hyun-Jin Ryu from the disabled list, will need to move at least one starting pitcher to the bullpen — two if they don’t go with a six-man rotation. Here’s a chart with some statistics. They’re not the best statistics, but they’re enough to give you a snapshot of the situation. The seven pitchers are listed in order of 2018 ERA. Clayton Kershaw, as long as he’s healthy, clearly will stay in the rotation. But what about the rest? Ryu was a top pitcher for the Dodgers in the first month of the season. He deserves a chance to show if that form still holds, but how much of a chance? Ross Stripling is an All-Star, who has struggled since the All-Star Game (no doubt someone out there thinks it was because he watched the Home Run Derby). Thursday’s outing in Coors Field only added to the mystery — he held the Rockies to one run in six innings, but he only struck out two in doing so. Wood, under the radar, may well be the Dodgers’ best pitcher this summer. Dating back to June 16, he has a 2.48 ERA, going at least 5 2/3 innings in nine straight starts without allowing more than three runs in any. Rich Hill, over the same period, has a 2.45 ERA and 61 strikeouts in 55 innings, to recover from his rough start to 2018. Walker Buehler’s ERA is inflated by his one ill-fated relief appearance this year — as a starter in 2018, it’s 3.07 with a 0.99 WHIP. He also, I think people would agree, has the best pure stuff in the rotation right now. That said, he has only gone past the sixth inning once since May. Maeda seems to me to be perpetually underrated as a starting pitcher in general, but like Stripling, his season has taken a turn for the worse. Since summer began, his ERA is 3.88. Since the All-Star break, it’s 6.88. Some of the deliberations the Dodgers have to make are subjective. Does Ryu get a tryout in the rotation after his three-month absence (and is he capable of pitching in relief)? Have Stripling and Maeda earned a longer leash? What health considerations play into any of these choices? A side debate involves whether Maeda is unfairly harmed by a move to the bullpen, considering the way his contract is structured to incentivize starts and innings. In my view, you don’t let that play into this decision. If he deserves to start, then he should start. If not, but he ends up playing a key role out of the bullpen in August, September and/or October, you would address the moral dilemma of his salary after the season has ended (not that I’d be holding my breath for that to happen). At the risk of punishing someone for achievement, I do think one reason to move Maeda to the bullpen is obvious: He excelled in that role in October 2017. Plus, as good as he is, you can’t make an iron-clad case that he’s one of the Dodgers’ top five starting pitchers today, though to be fair, Maeda’s fielding-independent ERA in 2018 is 3.19, fourth among the Dodger starting pitchers and only 0.09 behind team co-leaders Stripling and Kershaw. As tough as that decision is, it only gets harder when trying to figure out who would be the next cut from the rotation. Logic points to Stripling, who also has bullpen experience and is seemingly hitting a rut. But pitching fortunes change so rapidly, it wouldn’t shock me if Stripling suddenly bounced back and either Buehler, Hill or Wood faltered. Ryu, of course, is a complete wild card. I wouldn’t expect any definitive answers right away — whichever starting pitcher makes a relief appearance first might not be the one to make a relief appearance last. If anything, there is a silver lining that the Dodger pitching staff has this many options from the rotation to play with. 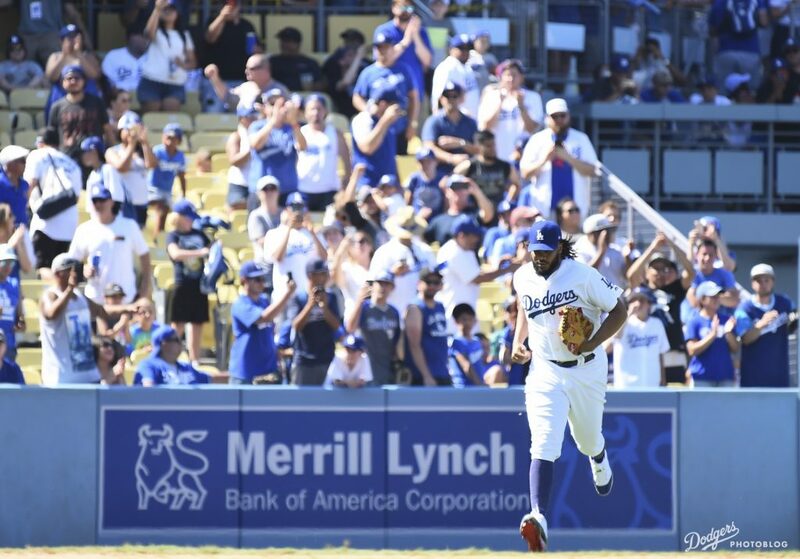 Above all, there’s no denying that Jansen will be missed, nor is there any underplaying how much we wish him a speedy recovery, and most importantly, a long life going forward. Click here to learn more! Brothers in Arms now available as an audiobook! Note: I got so busy working for the Dodgers that in 2014, I stopped keeping track, much to my regret.